M. Mushfiqul Fazal from New York, May 12 (Just News): There could be 10,000 boat people detained near the Thai-Malaysian border in more than 100 detention camps, held in custody by guards who are both locals and Rohingya, according to a top official in a humanitarian mission of the Chularatchamontree, Thailand’s Muslim spiritual leader. 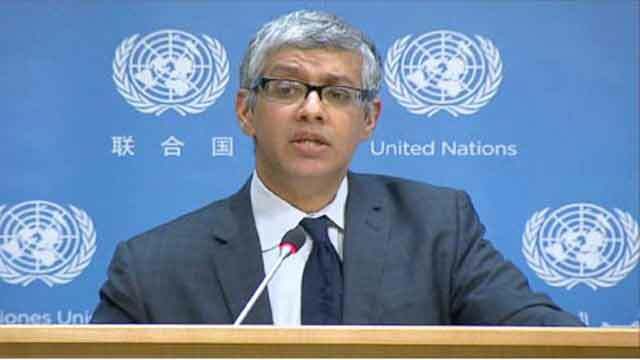 Addressing this inhuman and tragic issue, UN secretary general’s Deputy Spokesperson Farhan Haq said, ‘human trafficking has been a very serious matter. Part of our concerns, as in the Mediterranean Sea, is that all efforts to deal with migrants on the high seas take special effort to focus primarily on rescuing their lives’. He made this remark in the daily noon briefing at UN headquarter on Monday. Bangladeshi journalist and Just News BD Editor M. Mushfiqul Fazal draw this attention to UN. On reply Deputy Spokesman said, human trafficking has been a very serious matter. We talked about the problem of human trafficking which, as you know, contributed to the deaths of Bangladeshis and Rohingya a few days ago, and we had mentioned that last week. Farhan said, A lot of people are placed in danger and they placed in danger also from the actions by smugglers who have been very predatory with regard to how they treat the people who are seeking to travel from one place to the next. About UN steps on human trafficking he said, we have tried also to deal with the issues of human trafficking through different treaties and through the work of the UN Office on Drugs and Crime (UNODC), but separate and apart from that, all parties on the seas should take steps first and foremost to make sure that people lives can be protected. Earlier, boats carrying some 1,400 migrants were rescued off the coasts of Indonesia and Malaysia Monday, officials said, a day after nearly 600 others arrived in a wooden vessel off Indonesia's Aceh. The spate of arrivals comes as Thailand, a key stop on a Southeast Asian people-smuggling route, cracks down following the discovery of mass graves that has laid bare the extent of the thriving trade. Malaysian police said people-smugglers had dumped at least 1,018 hungry migrants in shallow waters off the coast of the resort island of Langkawi since Sunday. Langkawi police said the 1,018 people found there included 555 Bangladeshi men. There were 463 Rohingya, including 101 women and 52 children. We know that there are more boats out there that want to come Langkawi police chief Haritth Kam Abdullah told this citing police intelligence. Indonesian authorities said they intercepted a boat off the coast of the northwestern province of Aceh early Monday with estimates of at least 400 people aboard, a day after 573 people described by one official as, tired and distressed came to shore in Aceh. At least 92 children were among those brought ashore in Malaysia and Indonesia. The vessel discovered off Indonesia on Monday was still at sea, shadowed by the country's navy, said naval spokesman Manahan Simorangkir. He said the vessel was damaged but afloat and its captain had fled. The navy was supplying the ship with water and food but the spokesman said there were currently no plans to allow it to berth. Thousands of refugees from Bangladesh and Myanmar are stranded at sea close to Thailand, according to an international migration agency. The International Organization for Migration told that a Thai crackdown on recent arrivals meant many smugglers were now reluctant to land. As many as 8,000 people are believed to be stuck on boats, the IOM said. Jeff Labovitz, head of mission for IOM Asia Pacific, told that the discovery last week of dozens of human remains in abandoned camps in the south of Thailand had prompted a police crackdown and therefore people smugglers were holding their boats at sea. Boats seem to have stopped coming - but some are en route and some are waiting to off-load. Where they used to process people on land, for final payments, they are now doing this off-shore - so more people are being held off-shore. Now things have become so hot, there's nowhere for them to go, Labovitz said. He said that an estimate by the Arakan Project - which monitors the movements of Rohingyas - that 8,000 people are stranded at sea could not be verified, but seemed credible.